Visit the Square any Tuesday or Saturday from April through October, and you’re sure to be drawn in by the rich sights, sounds and smells all around you. In this season of abundant harvest, there are many ways to taste the fruits of our local farms. Julie Van Laar, her son Jonathan, and the rest of their family are familiar faces at the market. The Van Laars sell freshly picked produce and homemade bread produced at their Capron-area farm. On a Tuesday or a Saturday morning this fall, a walk around the Historic Woodstock Square is sure to stimulate the senses. It’s here that the twice-weekly Woodstock Farmers Market takes place, with 30 Tuesday vendors set up in colored pop-up tents around the inside perimeter of the Square. On Saturdays, 40 vendors squeeze in to entice passersby, who number up to 5,000. It’s a carefree, casual setting that encourages visitors to shop or to simply stroll and take in the sights and sounds. And there’s plenty to take in. The pleasant drones of a local musician playing or singing from the gazebo in the 2-acre park in the center of the Square may catch your ear first. Often, the artist is right from McHenry County, and you’ll find patrons sitting throughout the park enjoying the shade of mature trees as they listen and tap their feet. Your eyes are sure to be drawn to the colorful variety of fresh produce sprinkled throughout the market: bright-red tomatoes and radishes; purple, yellow and green beans; rows of tasseled sweet corn; orange carrots; white onions; brown potatoes and so much more. Then you’ll notice the smells: the aroma of Greek cuisine from Aleka’s Kitchen, the familiar scent of freshly popped popcorn from Brook Farm Popcorn, or the flowers blooms from Piscasaw Gardens. If you’re brave, you might try a hot sauce like Cherry Bomb – a concoction from River Valley Kitchens made from cherry bomb peppers, roasted tomatoes, red wine vinegar, onion, cayenne peppers, tomato paste, roasted garlic, celery, honey, olive oil and salt. “It’s got a little kick at the end,” says 8-year-old Aliza Miszczak on a recent Tuesday morning, after declaring she likes the hot sauce. Miszczak, her mother, Jessica, and younger sister, Bella, 5, were regulars at the market when they lived in Woodstock. But even now, as Huntley residents, they frequent the market, often bringing other family members, like “Grammy” Sylvia Winter. 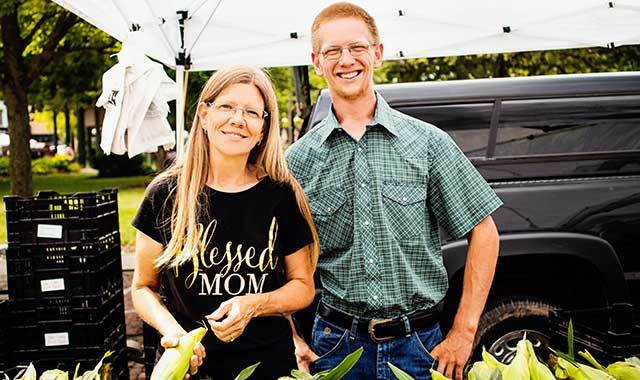 The communal atmosphere is why Trevor Kreutzer, an employee of River Valley Kitchens (RVK), specifically asks to work the Woodstock Farmers Market. RVK has catered to various markets for 30 years, hitting 30 farmers markets each week from Madison to downtown Chicago, while also supplying multiple restaurants with its organic mushrooms and offering additional fare on-site at its farm in Burlington, Wis. But the Woodstock market stands out, Kreutzer says. Rich Brook sells popcorn made from corn he raised on his Harvard-area farm. It’s no coincidence that the Woodstock Farmers Market feels neighborly. As a producers-only market, only vendors who grow or produce their own goods are invited to sell here. And preference is always given to local, Illinois vendors before out-of-state vendors are solicited. Rich Brook, of Brook Farm Popcorn just outside of Harvard, grows his own popcorn and sells it as kernels and popped products. Similarly, the Van Laar Fruit Farm from Capron not only harvests fruit and vegetables, but grows its own wheat for the homemade sourdough bread baked by 19-year-old Sarah Van Laar. Johnson himself visits the farms periodically to make sure every vendor is selling exactly what they grow. It’s an act appreciated by Julie Van Laar, the matriarch of the seven-family-member Van Laar Fruit Farm. “Other markets don’t take that extra step,” she says. And it’s not just the vendors who notice the extra effort. That’s why, when you hear the strong, hopeful voice of 24-year-old Jonathan Van Laar call out, “fresh corn, picked last night!” you know he speaks the truth. It’s a pick-up line, to be sure; but it works. The Van Laars have many loyal customers who shop with the family every week. Hennie Reynders of Bull Valley is one of them. You may not think to look for fully cooked meals at a farmers market, but there are several options available at the Woodstock market. Aleka’s Kitchen offers authentic Greek cuisine, including main dishes like penirli (Greek pizza) and dessert like baklava (sweet pastry). Patrons who enjoy the flavors are quick to tell you so. The bubbly patron frequents the area’s farmers markets, particularly Woodstock. While Aleka’s Kitchen serves fresh, warm, ready-to-eat dishes, the market’s NOLA Ice Snowballs offers fresh, cold, ready-to-eat flavored snowcones. And just because you’re at a farmers market doesn’t mean you immediately have to eat what you buy. Tiffiny Kovin of Taste Budz understands that convenient, easy meals are hard to come by for parents and working individuals, especially those who crave home-cooked food. A former Highwood restaurant owner, she now offers a variety of freshly frozen items for patrons to take home and heat up, including homemade soups, chilis and chowders, fire-roasted hummus and salad dressing. Her barbecue pulled chicken is a market favorite. You’ll also find seasonal fish sold by the pound at Sitka Salmon Shares and other meals sold at varying vendors. 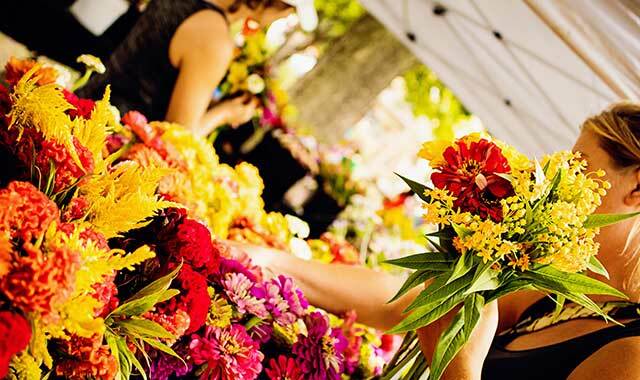 Jennifer Kinney, of Harvard, sells fresh flowers from her Picasaw Gardens. While 50 to 60 percent of the market is geared toward farm products, there’s more than food at this market. Sue Nell, a human resources and accounting employee at MBI in Woodstock, is a regular market patron of Piscasaw Gardens, which sells flowers grown by Jennifer Kinney of Harvard. Many patrons find it easier to order flowers for parties, weddings, graduations and other events by talking to an employee of Piscasaw at the market, rather than over the phone. Others grab a bouquet of flowers for a friend or someone who is not feeling well, says employee Caitlin Conner, 13. “A lot of kids will come and get these minis [bouquets],” Conner says. There’s also Mimi’s All Natural Pet Treats; custom wood turning from The Rustic Barn; olive oil soaps and herbal balms from Soap Of Earth; homemade knitted and woven products from Blue Loom; and fused glass pieces from Dragon Scale Dreams, among other vendors. 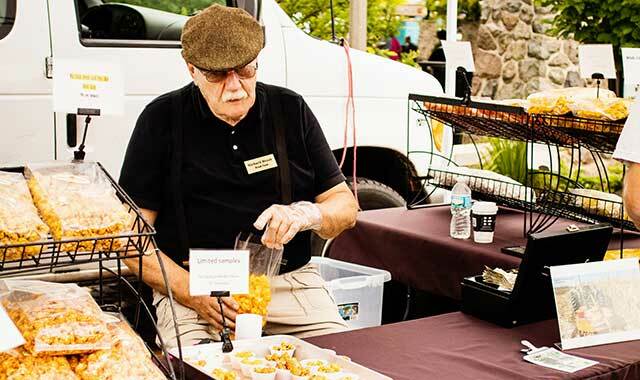 With a blend of produce, artifacts, music and entertainment, the Woodstock Farmers Market has become a gathering place for patrons to support local businesses and artisans. “I think our market is a community event, with local music, local products, local farms,” Johnson says. Above all, the market supports human connectivity, which Johnson is thrilled to see. “People know who our vendors are and why they’re doing what they’re doing,” he says. This entry was posted on Monday, September 24th, 2018 at 11:58 am	and is filed under Features, Top Posts. You can follow any responses to this entry through the RSS 2.0 feed. Both comments and pings are currently closed.